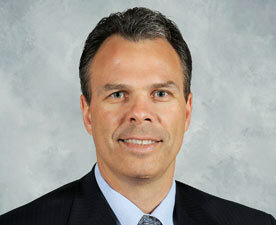 Kevin Cheveldayoff enters his sixth season as General Manager of the Winnipeg Jets after being named to the position in June, 2011. In Cheveldayoff’s first five seasons with the team, the Jets have earned an overall record of 176-156-44. Prior to his time in Winnipeg, Cheveldayoff spent two seasons with the Chicago Blackhawks serving in the role of Assistant General Manager/Senior Director, Hockey Operations. During Cheveldayoff’s tenure, the Blackhawks won the 2010 Stanley Cup championship. Before joining the Blackhawks in 2009, the Blaine Lake, SK native spent the previous 12 seasons as the General Manager of the American Hockey League’s Chicago Wolves, guiding the franchise to four league championships, which included the 2002 and 2008 AHL Calder Cup championships and 1998 and 2000 IHL Turner Cup championships. Overall, Cheveldayoff has been a part of seven league championships during his 15-year management career, which includes two Turner Cups in three seasons as the Assistant Vice-President of Hockey Operations and Assistant Coach for the Denver and Utah Grizzlies (1995-96). Cheveldayoff was the architect of 12 Wolves teams that compiled a 0.615 regular-season winning percentage (544-320-114) and 10 postseason berths from 1997 to 2009. Eight of those clubs reached the 100-point mark during the regular season while earning four division titles and six postseason conference championships. Originally drafted by the New York Islanders with their first pick (16th overall) in the 1988 NHL Entry Draft, Cheveldayoff began his career in the AHL with the Capital District Islanders, serving as the alternate captain from 1991 to 1993. He held the same role with the Salt Lake Golden Eagles in 1993-94, earning the team’s "Unsung Hero Award" after racking up a career-high 216 penalty minutes in 73 games. Known as a defensive defenceman during his playing days, a knee injury cut his professional career short after five seasons. Cheveldayoff spent four seasons with the Brandon Wheat Kings of the WHL where he played in 214 games and collecting 81 points (12g, 69a) as well as 759 penalty minutes. Kevin and his wife, Janet, have one son, Chase, and one daughter, Alexi.